In Egypt, the importance of a beautiful image is not a superficial one; particularly for girls. In many of the local villages, marriages are agreed upon during adolescence. It is believed that marriage is not a decision based on individual happiness, but a collaborative partnership that includes acceptance from both sides of the family. Most families value the happiness of the son or daughter and the future bride and groom can refuse a proposal. However, in some remote areas of Egypt, superstition runs high and scars, birth defects, or health problems, such as asthma, are deemed a curse. In six month old Mennah's case, her mother and aunt insist on eyeliner to enhance and draw attention to the eyes – the window to the soul in many parts of the Arab world. 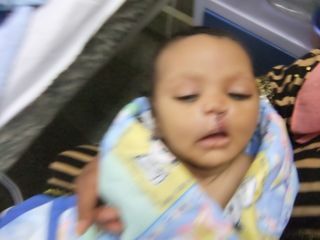 It is the hope of the family that Rotaplast daughters can repair Mennah's cleft lip and palate, thereby "lifting this curse" and allowing Mennah a future that includes marriage and children. Rotaplast cannot guarantee marriage, but with the talents of Dr. James Hoyt, plastic and reconstructive surgeon and Rotaplast volunteer, Mennah's lip and palate can be fixed, and she will be able to speak, eat, and, of course, smile. Mennah, featured on the right is resting from her surgery. The photo is a little blurry because her mother is rocking her back to sleep. Although the mother did not want her own photo taken, she was smiling from ear to ear. 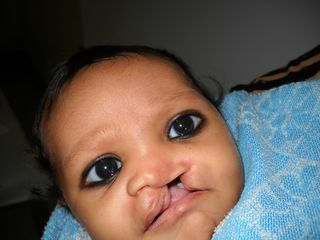 Rotaplast hopes that Mennah and her mother will be smiling for years to come.